I love chai tea and chai lattes. From the first time I ever tried a chai latte from Starbucks I was hooked. The warming spice and the creamy textures marry together beautifully to create the perfect Autumn hot drink. I’m not much of a hot chocolate person and this is my ultimate substitute. 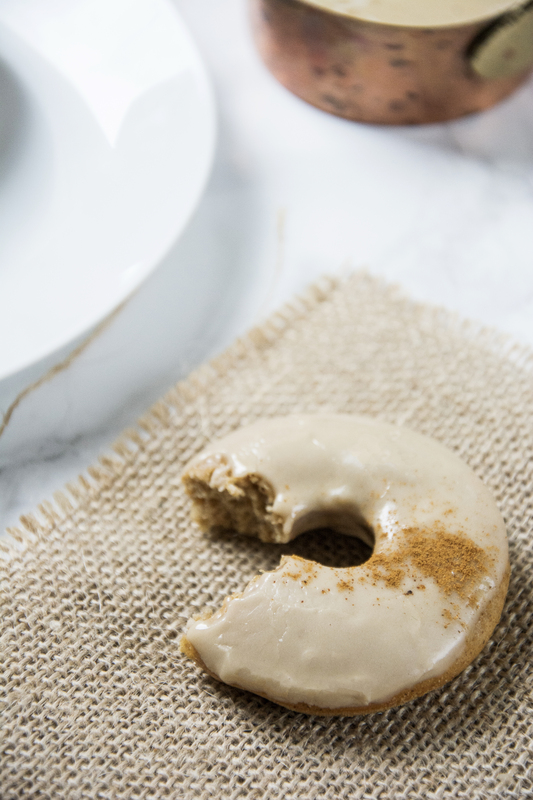 Beautifully soft baked donuts spiced with allspice and cinnamon. 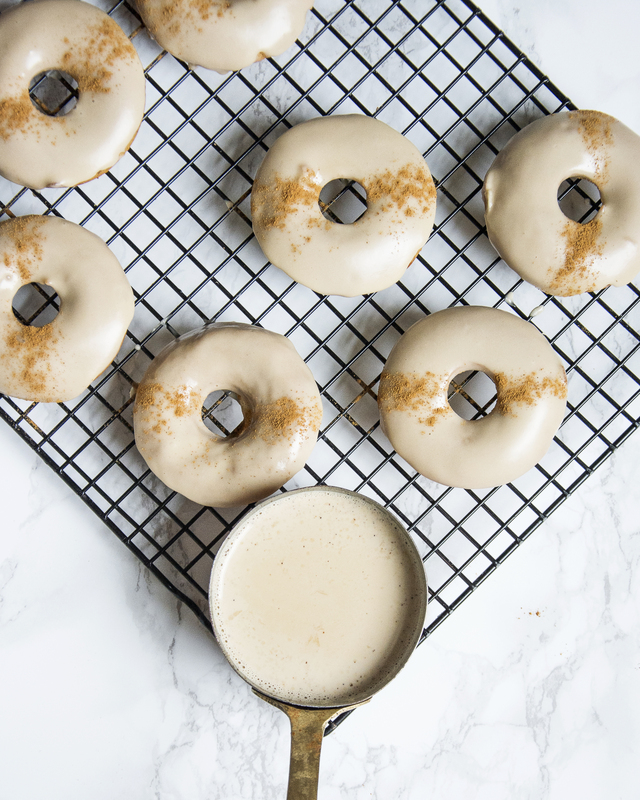 These donuts are chai spiced and have a creamy chai frosting to top them. Chai tea bags are pretty common now I think I picked up 50 from Asda for under £1. But you can also get them Here if you can’t find them. If you haven’t tried a chai latte yet I highly recommend this brand available here . But they are available at most chain coffee shops. My favourite way to make them is with the chai powder mixed with hot water to form a paste then pour steamed milk over to combine. 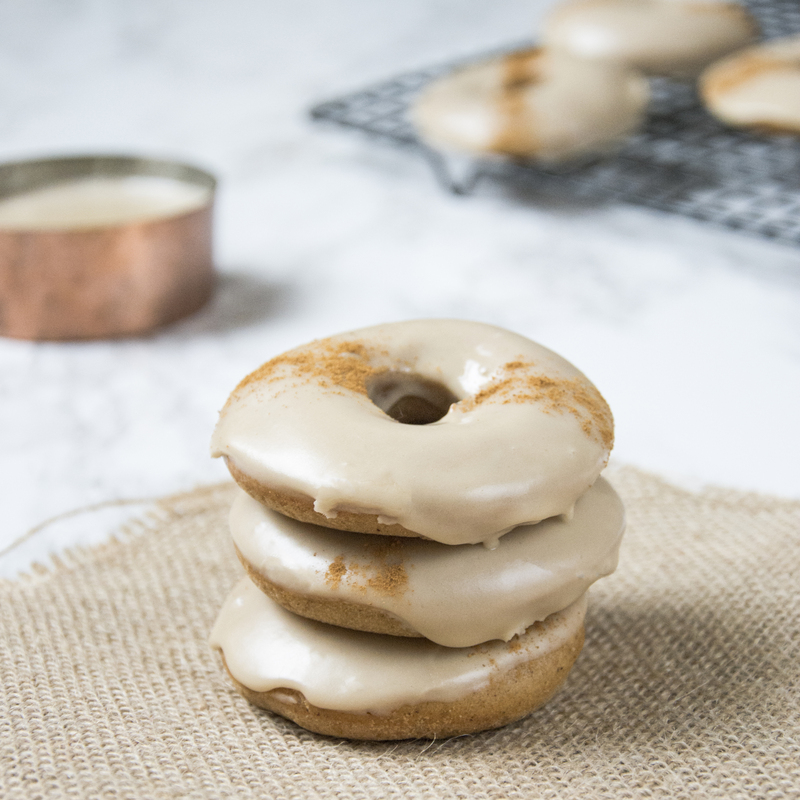 For this recipe you will need a donut pan, I don’t recommend an expensive one if you are not going to use it often, I use these here and I have never had a problem with them. They do however produce smaller donuts, which is perfect for me as I like smaller treats. Preheat your oven to 190C. Spray a donut pan with cooking spray. In a saucepan, gently heat the milk over a medium heat until hot and steamy but do not let it boil. Add the teabags and remove from the heat and allow the teabags to steep for 10 minutes. Remove the teabags, squeeze and discard. Sieve the flour into a bowl, add the baking powder, sugar, cinnamon and mixed spice and stir to combine. Add the egg, oil, 3 tablespoons of the chai milk, yogurt and vanilla. Stir well to combine all. Transfer the batter to a piping bag or a ziplock bag, snip the corner off and pip an even amount of batter into each donut mould. Bake 10-12 minutes until the donuts spring back when pressed lightly. Remove from the oven and allow to cool 5 minutes before transferring to a cooling rack to cool completely. Sieve the icing sugar into a bowl, add the vanilla and 2 tablespoons of the chai milk. Stir well adding a tablespoon of the chai milk at a time mixing well in-between. Keep adding the chai milk 1 tablespoon at a time until the icing is thick but still a little runny, enough to dip the donuts in. Dip one side of the donuts in the glaze and return to the cooling rack to let it set. Sprinkle with additional cinnamon to decorate. 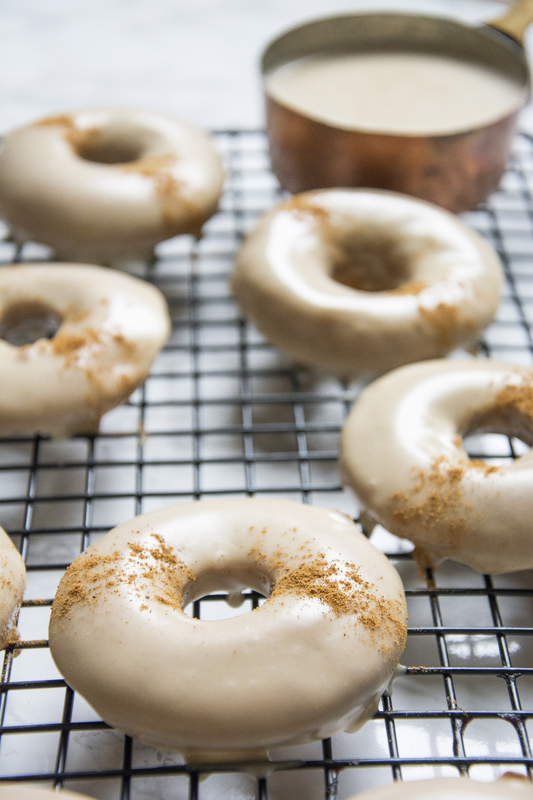 And there you have it, beautiful chai spiced donuts. A perfect autumn treat. If you try these donuts let me know how they turn out by tagging @whatseatingmanchester in your social media post.